These beautiful garden chimes sing out memories of your loved one. It has been paired with a metallic silver keepsake holding the cremains of of your loved one (attached to the sail.) Keepsake is 2" high by 1/2" wide at base and holds 1/2 a teaspoon of cremains. Mezzo 38" 5lb 1 2/16"
Alto 50" 10lb 1 1/2"
Bass 90" 45lb 2 1/2"
Tough synthetic cordage is highly resistant to abrasion, ultra-violet degradation, rot and mildew. Central tube suspension with smoothly polished tube ends prevent cord abrasion typical of other, less labor-intensive suspension techniques. Heavy gauge polished stainless steel rings provide sturdy support and enduring beauty. Tempered aluminum alloy tubing is custom manufactured to exacting specifications and will never rust. Corrosion-protective finish preserves chime's appearance and increases durability in hostile environments (acid rain, salt air). Tubes are tuned to A440, standard orchestral pitch, using the latest in technology. Solid polyethylene clappers provide superior tonal quality and outdoor durability. 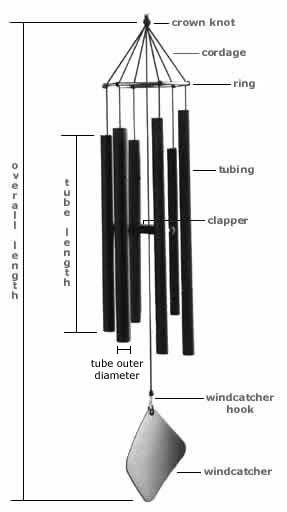 The windcatcher, of the same finish and material as the tubes, is the ideal size, weight, and shape for optimal chime performance in 8 - 10 mph wind velocity. The windcatcher hook assembly provides simple but effective method of varying the chime's activity level.